We hold expertise in exporting & supplying of Levitra 20mg Tablets from West Bengal, India. Made from the finest quality ingredients, our 20mg Tablets are widely demanded. Purity, effectiveness and quality are some of the key factors that make our offered range of Levitra 20mg Tablets different from the others. Levitra (vardenafil) relaxes muscles found in the walls of blood vessels and increases blood flow to particular areas of the body. 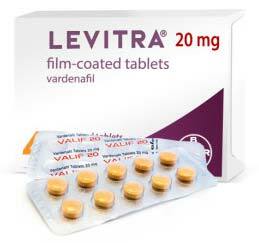 Levitra is used to treat erectile dysfunction (impotence). Levitra may also be used for purposes not listed in this medication guide.